Enjoy your big day Cam! Charles Edward Gregory (Franklin Clemons, John Keatts, William, John, Thomas III, Thomas II, Thomas, Richard) was one of twelve children born to Franklin Clemons and Shelma Statira V. (Shawver) Gregory in Tazewell County, VA. Charles, my 1st cousin, 3x removed, married Yeuracia Florence (Caldwell) on February 23, 1860. 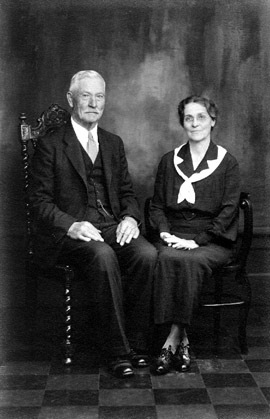 They had two children that I know of – Carl David and Jenetta Fay “Nettie” Steele. 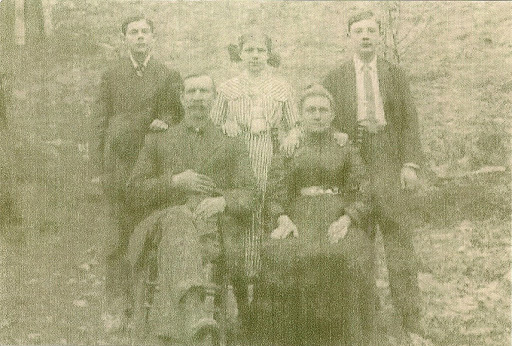 Carrie Nelia Kiser (Lilburn Hendricks, Andrew A., John C.) was one of ten children born to Reverend Lilburn Hendricks and Frances “Frankie” (Sutherland) Kiser. See post on June 10th for siblings. Carrie, my 6th cousin, 2x removed, married Ephriam Mexico Kiser on July 4, 1899 in Russell County, Va. They were the parents of six children. My great grand uncle, Solomon Lemuel Brooks (John Jeremiah, Constantanople, William) married Rosanna Amburgey. Uncle Sol was one of thirteen children born to John Jeremiah and Elizabeth “Betty” (Hill) Brooks. He and Aunt Rosa had three children that I know of, (1)Swanson, (2)Ezra, (3) Ester. I was born on Big Rock Creek, right under Roan Mountain, in Mitchell County, North Carolina, on January 17, 1856. My parents were John and Elizabeth __________ (I forgot her maiden name). My grandparents were Constantine and __________ Brooks. He was a half Indian and lived in Rutherford County, NC out the South Carolina line. 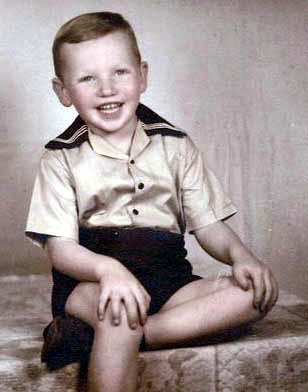 My parents came to Sandy about 1866 or 1868 – I was ten or twelve years old then. They settled on Russell Fork, just below the Johnson Bottom Baptist Church and a short distance above the mouth of Indian Creek. It was on the old Billy Barnett Place. We stayed there four or five years, and then moved into the woods up on Sullivan Branch near Henry Sutherland’s. The people I remember being in that section at that time were John Duty, Henry Sutherland and the Tillers. Old Man Duty, the father of Doctor John, was dead, but he had lived at the forks of Indian Creek, where Lem Duty later lived. Billy Barnett lived near the Johnson Bottom Church. He had known my father before they left North Carolina, where they had lived near each other. Jerry Compton and Burrell Compton lived on Abner’s Branch. Bill Barnett, son of Billy, lived at the mouth of Big Branch. Feddy Deel had his home down the river a mile or two, and Ancil Johnson lived on the ridge near where his son, Harve, now lives. On our trip to Virginia, we all walked most of the way. We carried bundles of clothing, cooking vessels and other things. My oldest brother, Alfred Broods, had married Billy Barnett’s sister and had already settled on a farm below the mouth of Abner’s Branch. We came on the railroad to Abingdon, Virginia; then on the dirt road through Hayter’s Gap in Clinch Mountain; then by Nash’s Ford, Big A Mountain and on down Russell Fork to the Barnett Place, where we settled first. There were few roads at that time, and it was four or five years after we came that we saw any wagons on our section of Russell Fork. Father has been dead about twenty years. He died on Copper Ridge, aged 94 years, 9 months and 9 days. Mother died about 16 years ago, aged 94 years, 6 months and 6 days. There were no schools on Russell Fork when I moved there. We stayed at the Sullivan Branch Place five or six years, and then moved to the Joseph Artrip Place at the mouth of Island Branch below Cleveland. I have shot the gun that killed Indicut on Long Ridge near Abner’s Branch. Dr. John Duty had it when I shot it. I used ita lot in hunting. One day Henry Sutherland told me I would find the print of a rifle’s muzzle in a chestnut log on Long Ridge, and that it was made by the Indicut gun. Me and my brother Charles looked it up one day and found that it fit the gun exactly. I have heard the old folks talk a lot about Brewer killing Indicut on Long Ridge, but I don’t remember the details now. 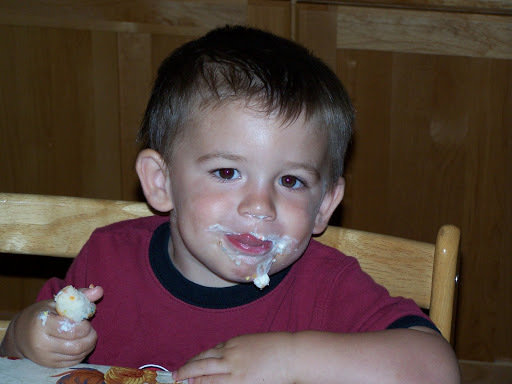 Have a great day cuz! My 3rd cousin, 1x removed, Donald Edward Tabor (George Edward “Hub”, Henry J., Stephen Paris, James, William) was one of only two children that I know of born to George Edward and Annie Marie (Harris) Tabor. 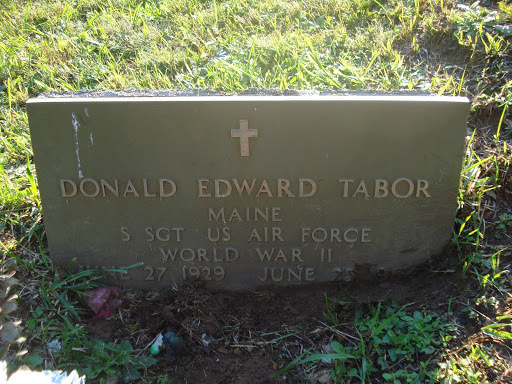 His sister was Judy Gail Tabor. 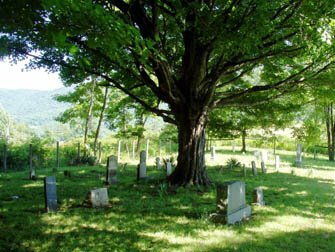 Donald Edward served in the US Air Force during World War II and is buried in the Tabor Cemetery at Mudfork, Tazewell County, VA.
Obed E. Gregory was one of ten children born to Thomas Edward (John Keatts, William, John) and Martha J. (Steele) Gregory. 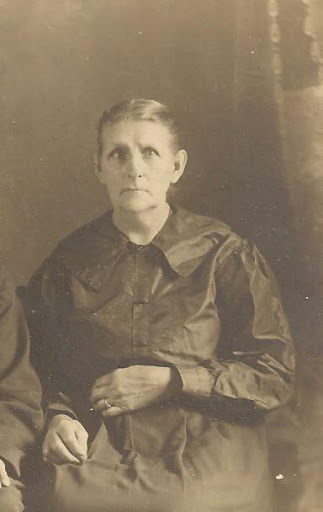 June 24, 1857 – November 21, 1922 My great grandmother, Eliza Greever Gregory, was one of six children born to Daniel Parham and Mary Jane (Daugherty) Gregory in Tazewell County, VA.
Eliza married Erastus Granger Davidson on July 22, 1859 and they were parents to eight children. 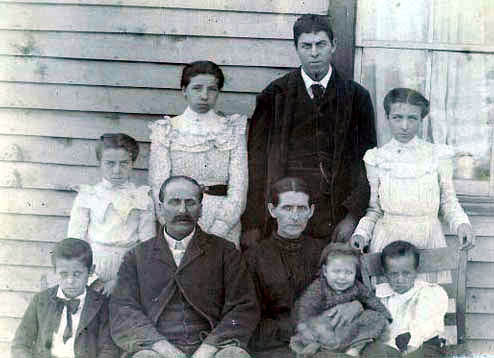 This picture shows the family except for Ella, so it was taken between 1901 and 1903. Melissa M. (Walker) married my 1st cousin, 3x removed, George Fulton Daugherty (David Allen, John L., John, John). George was 1st cousin to Eliza above. Her mother, Mary Jane Daugherty and his father, David Allen Daugherty were siblings. Rosy M. Davis (Charles Henry, Thomas Jefferson, Caleb, Robert) was one of six children born to Charles Henry “Charley and Mary Ann (Fields) Davis in Russell County, VA.